We’ve been a Michigan based phone company for over 15 years with experience in VoIP (Voice over IP) deployments. 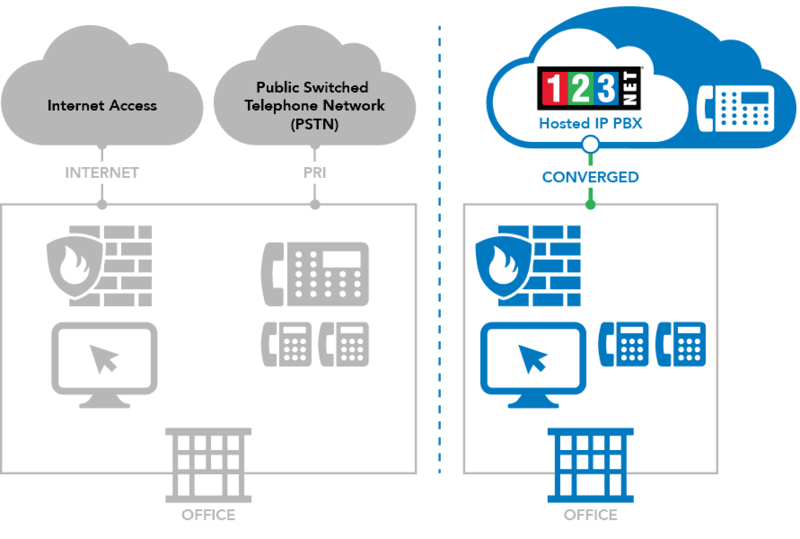 Compared to a traditional phone system, 123Net manages the delivery of the Hosted IP PBX over its robust network and moves the PBX functionality from your office to its Tier 3 2(N+1) data center. This includes built-in redundancy and a Service Level Agreement (SLA) guarantee of 99.99% uptime. Setup is quick (30-45 days), and a 123Net project manager will help with a smooth conversion. Connect desktops and smart devices through the 123Net application. Transfer existing phone numbers or order new numbers like vanity toll free. Desk phones will be placed and fully configured by a 123Net engineer. Manage the entire 123Net phone system from a desktop computer or smart device through the 123Net web portal. A user-friendly web interface offers complete control over the phone system with easy to use menus, text fields and check boxes. Change users, manage extensions from anywhere in the world. Users can manage their own settings. Hosted IP PBX solution provides a feature rich technology that will increase productivity within your organization. The user-friendly web driven control panel offers enhanced features in an easy to manage interface. The 123Net Hosted IP PBX uses the Polycom enterprise-grade family of IP desktop phones.